NDP Leader Jagmeet Singh is trying to shrug off his party’s poor showing in a series of byelections that were held on Monday. Four byelections were held on Dec. 11 – one each in Newfoundland, Ontario, Saskatchewan and British Columbia. In all of them, the NDP saw its share of the vote decrease compared to the 2015 general election. In three of these ridings, Singh’s party also placed third behind the Liberals and Conservatives. Only in Saskatchewan’s riding of Battlefords—Lloydminster did the NDP reach second place, with 13.2 per cent of the vote over the Liberals’ 10.4 per cent, which is still a 4.4 per cent decrease for the NDP compared to 2015. The Conservatives, however, easily held onto the Saskatchewan seat they won in 2015, netting 69.5 per cent of votes in the byelection. The only byelection that upset the status quo was the one held in B.C.’s South Surrey—White Rock riding, where the Liberals beat out the incumbent Conservatives. In both Ontario’s Scarborough—Agincourt and Newfoundland’s Bonavista—Burin—Trinity, the Liberals held onto their seats, albeit with less support than in 2015. With the exception of South Surrey—White Rock, the Conservatives saw steady gains over 2015. “These weren’t ridings that we were typically known to be strong in,” Singh explained in the interview. The NDP leader also said that he expects his party to make gains in urban areas like Ontario’s Brampton, Mississauga and downtown Toronto, as well as in Surrey, B.C., in the next general election, which will take place on or before Oct. 21, 2019. In the interview, Singh also discussed plans for electoral reform and climate change; the recent appointment of a new conflict of interest and ethics commissioner; the government’s plan to procure used jets from Australia; and marijuana legalization. 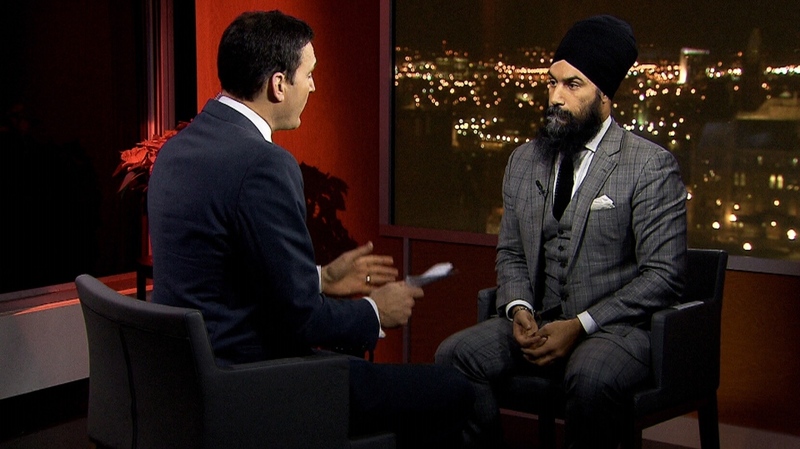 NDP Leader Jagmeet Singh speaks with CTV Question Period’s Evan Solomon.